The deadline is fast approaching for those who would like to provide comments on the draft environmental document for Eden Landing Phase 2 – comments need to be submitted by close of business Tuesday, June 5, 2018. The Draft Environmental Impact Statement/Report lays out alternatives for habitat restoration and improvements, new trails, and flood protection on more than 2,000 acres near Hayward and Union City, and analyzes the projected environmental impacts for each alternative. We welcome your comments. The draft document can be downloaded here. Comments can be sent by email to phase2comments@southbayrestoration.org. For more information about places to view a hard copy of the document, or additional ways to submit comments, see http://www.southbayrestoration.org/planning/phase2/. New Infusion of $7.4 million in Measure AA funds! We are thrilled that we are receiving significant funding from the San Francisco Bay Restoration Authority in Measure AA regional parcel tax money. 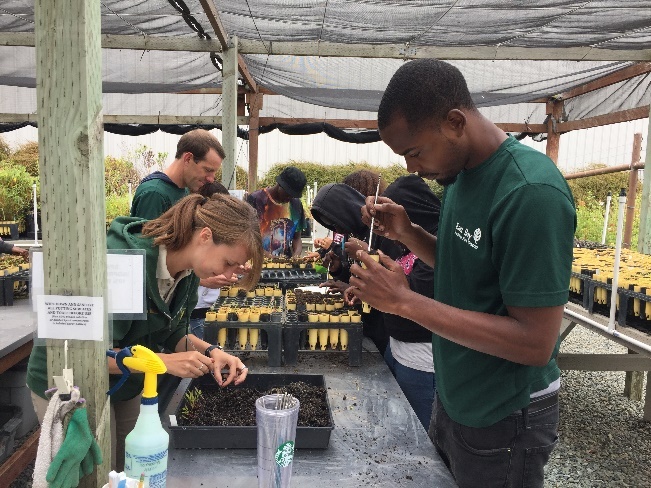 With this grant award, we now have full funding to pay for all planned Phase 2 construction in Alviso and Ravenswood as well as substantial funds for Phase 2 scientific work. We will be applying to future Measure AA rounds for funds for Eden Landing. Ravenswood: 295 acres of salt marsh restoration, including 15 acres of new gently sloping marsh-upland transition habitat along the edge of the Bedwell Bayfront Park landfill; raising a levee to reduce flooding risks; improvements to 60 acres of ponds for ducks and shorebirds; and a new half-mile trail. Alviso: Additional breaches of Island Pond A19 to speed restoration of salt marsh habitat for endangered species. Phase 2 applied studies and monitoring. Regional integration workshops to increase knowledge and efficiencies, and work toward data sharing and developing a system of regionally integrated data collection and analysis. A climate change impact synthesis report that analyzes the latest research to understand impacts on achieving our restoration objectives. 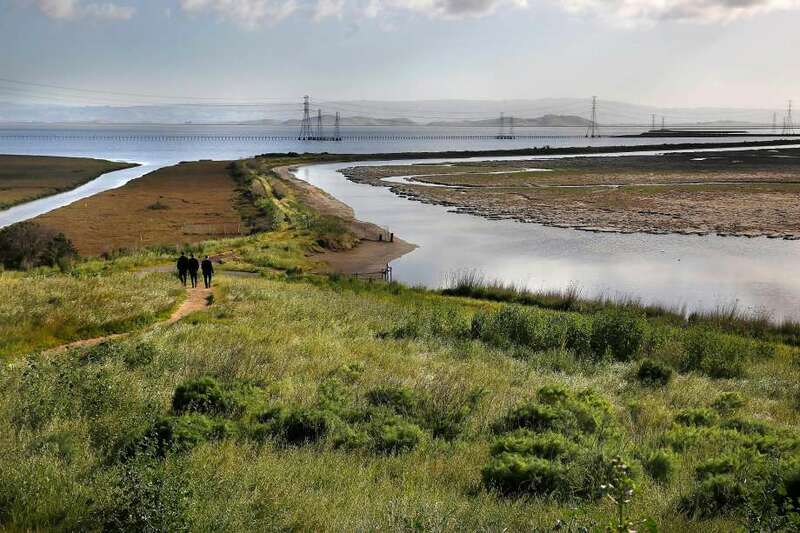 In addition to the South Bay Salt Pond Restoration Project grants, the Santa Clara Valley Water District received $4.4 million for our sister project, the South San Francisco Bay Shoreline Project, which will build a flood protection levee along the San Jose shoreline, add trails, and restore wetlands in the Alviso area. The Don Edwards Refuge expects in June to start shoring up levees that protect Ravenswood bird ponds by bringing in additional soil. Trucks will need to cross the City of Menlo Park’s Bedwell Bayfront Park to reach Refuge lands. To protect public safety, a front parking lot will be fenced off, and portions of the San Francisco Bay Trail loop in the Park will be temporarily closed or moved. Trails will only be closed when trucks are present, and will be open on evenings and weekends. Signs, barriers and a flagger will be present to protect the public. Phase 2 restoration and trail-building work is expected to start at Ravenswood later this year. For more information, see the Refuge website here. Our sister project, the South San Francisco Bay Shoreline Project (until recently called the Shoreline Study) is getting closer to construction on its planned levee to protect the San Jose shoreline. Plans are underway to bring in dirt for the levee in fall 2018, with construction expected to start in 2019. 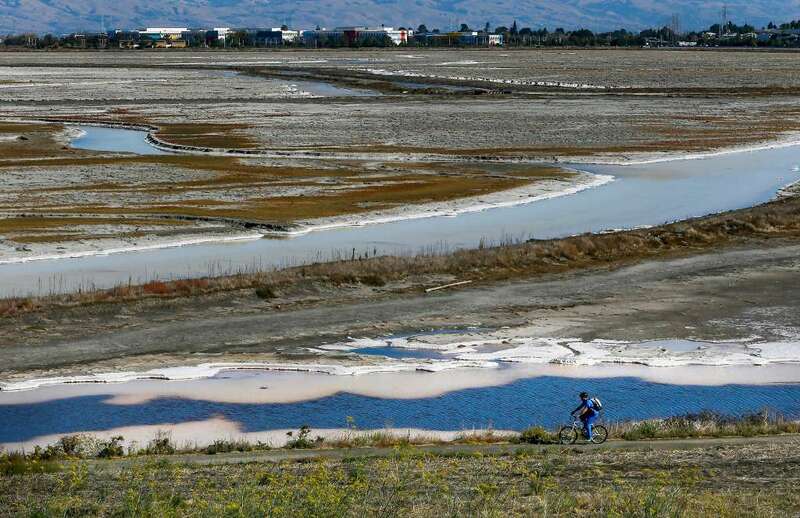 The dirt trucking may impact some trails and the Alviso Marina. 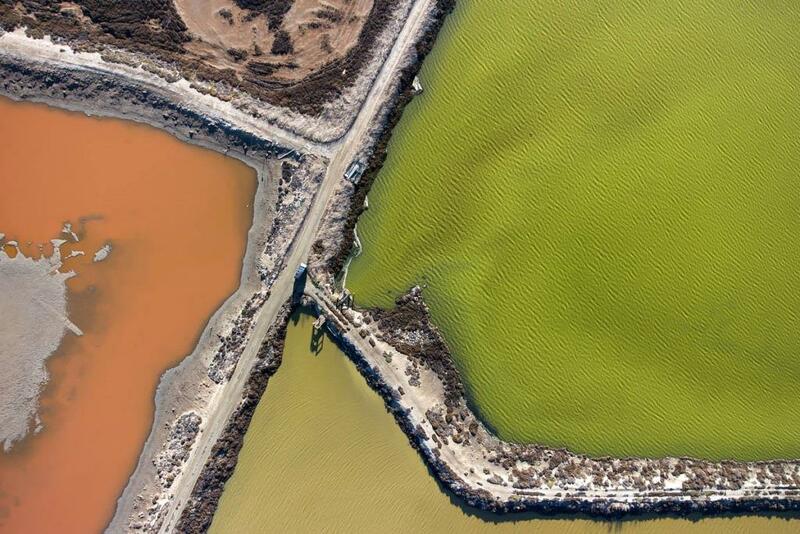 Shoreline Project partners will hold a public meeting in Alviso on Monday, June 18 to share the latest information and dialogue with the public. See the sidebar for meeting specifics. Look for email updates, or check the Shoreline Project website at http://www.southbayshoreline.org/ for more information. The Project has just released a high-level summary of Phase 1 science that includes a scoring system for how, after Phase 1, the Project is doing in meeting its scientific targets. After each phase, Project managers, project scientists and the independent scientists on the Project’s Technical Advisory Committee will assess and score progress toward targets such as maintaining shorebird numbers and water quality levels. To see the summary, click here. To see a simplified scorecard, click here. To see the full USGS report by past Lead Scientist Laura Valoppi, from which the summary was drawn, click here. Technical Advisory Committee met to assess Phase 1, make recommendations on Phase 2. The TAC, composed of scientists and experts who are independent from the Project, offered valuable analysis, insights and advice at its summer 2017 all-day meeting. Based on their thoughts, we have planned for Phase 2 regional restoration and science integration meetings, and refined the framing of our progress tracking scorecard, among other items. Managers plan to seek TAC advice at a minimum at the end of each phase. Outstanding Environmental Project Award for Phase 1 work! 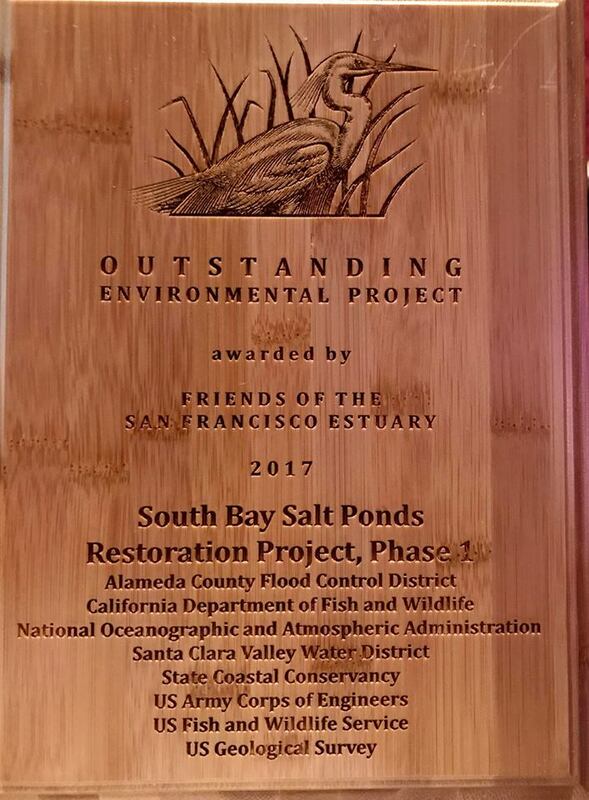 Restoration Project managers were thrilled that the Project’s Phase 1 work was selected as one of the Outstanding Environmental Projects by the Friends of the San Francisco Estuary at the biennial State of the Estuary conference this past October. Over 10 years, ending in 2016, Phase 1 initiated natural salt marsh restoration on 1,600 acres; opened 1,440 pond acres to muted tidal influence; enhanced 710 acres of ponds with islands, mounds and water level improvements; created 7 miles of trails; and built a kayak launch. The changes have boosted native fish populations, created new salt marsh homes for endangered species, and fostered nesting areas for snowy plovers, least terns and Caspian terns. The plans and work have been managed adaptively, with scientific studies to assess impacts and progress toward habitat targets, any feedback loop so that science informs later construction. See Restoration Project-related presentations and posters from the State of the Estuary Conference here. For years, Save the Bay has brought its staff and public volunteers to Restoration Project lands. The people come and go, but what they create remains: rich swaths of native plant habitat on levees and along trails, at the edges of our wetlands. In recent years, the nonprofit is one of a handful of organizations gearing up to go big, as the Restoration Project and other bayside public land stewards plan to construct new uphill areas above wetlands — called marsh-upland transition zones— to provide refuge to wildlife from rising seas and storms. The plant restoration work will help ensure that these new expanses of soil host the proper habitat for wildlife and minimize the growth of urban weeds. Donna Ball is in charge of engineering Save The Bay’s planting expansion. 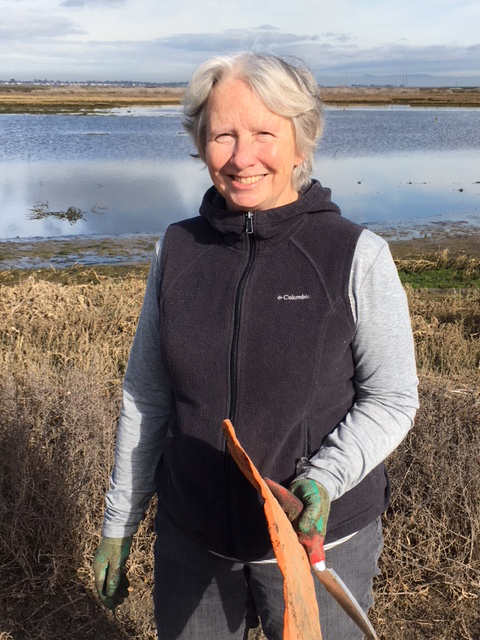 The nonprofit’s Habitat Restoration Director, Donna knows the South Bay Salt Pond Restoration Project well – in the early 2000s, she helped develop our first planning and environmental analysis documents, when she worked for environmental consulting firm H. T. Harvey and Associates. “It’s been fun for me to have the deep knowledge of the Project,” she said. Donna took some time one recent afternoon to talk about Save The Bay’s work with the Restoration Project, past and future, and to share her enthusiasm for plants, wetlands, and working with colleagues, partners, and youth. Tell us a little bit about your current focus at Save The Bay, greening these new marsh upland areas. We are very excited about our upcoming work with SBSP Project, the US Fish and Wildlife Service, and Ducks Unlimited at Pond R4 in Ravenswood where we will be piloting some new approaches to our work. For years, Save The Bay worked in very narrow transition zone areas. As we’ve all come to understand, with sea level rise, we’ve come to value the concept of larger transition areas. A larger transition zone can provide accommodation space for the marsh, if it has to move over time. Since joining Save The Bay in 2012, my focus has been on finding ways to scale up our restoration work at our transition zone restoration sites. In light of sea level rise predictions, we know that large, wide transition zones are going to be key components of large projects such as the SBSP Project to help offset sea level rise impacts. We are working to develop methods to grow plants for these larger projects at scale; in particular for 20-30 acre transition zone sites. It’s cost prohibitive to grow plants for large projects, at $4-8 a plant. 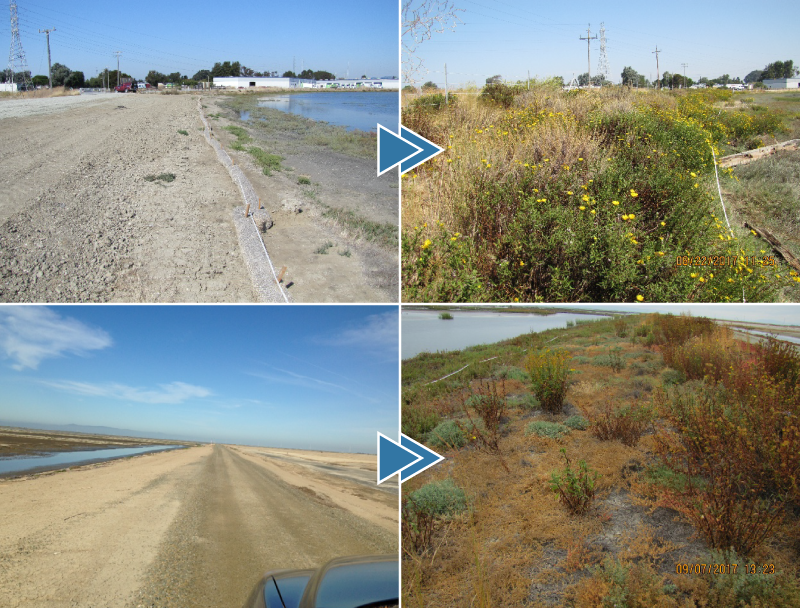 Through our work on the Oro Loma Horizontal Levee Project, we’ve tried some different experiments. 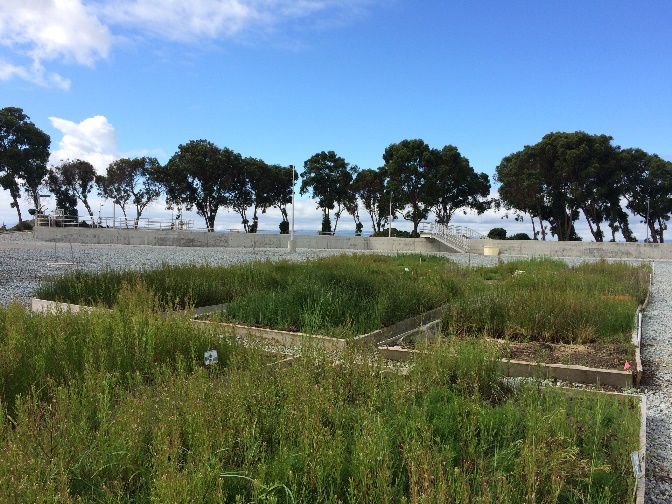 [The Oro Loma Sanitary District in San Lorenzo has developed an experimental “horizontal levee,” a vegetated slope, watered with treated wastewater. Save The Bay is one of the organizations involved in the project. See https://oroloma.org/horizontal-levee-project/.] We are working a lot more with rhizomatous plants [plants that grow by spreading roots and stems underground]. If you think about crabgrass as an example, you have one little plant, but it will multiply into more. We are looking at planting rhizomes – we can plant one, and that one rhizome can multiply into seven or eight little plants. At Ravenswood Pond R4, we are hoping to grow plants in raised beds nearby, using rhizomatous plants to scale up the vegetation there. At Bel Marin Keys in Marin County, we are doing experimental farming of rhizomatous plants: salt grass, marsh baccharis (in the same family as coyote brush), creeping wild rye. Large areas of the Bay used to be covered with wide swaths of grasslands composed of salt grass and creeping wild rye and other species. In the experiment, we hope we can farm them, and experiment with tilling them under to save costs on planting. We’ve also developed some collections of seeds to hand scatter, focusing diversity on what you would have found along the Bay originally and what is appropriate for a given site. The most important thing to me is the value of our partnerships. Save The Bay could not reach the number of people we do without the great collaboration and relationships that we have with all of our partners all around the Bay. 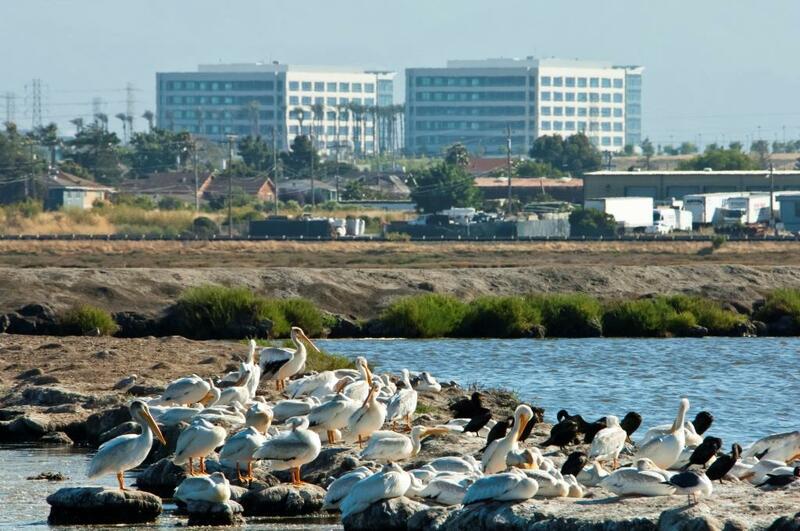 We do not own the land on which we work and so we are able to do our work by collaborating with other partners, such as the South Bay Salt Pond Restoration Project, the California Department of Fish and Wildlife, and the U.S. Fish and Wildlife Service on whose projects we work at Eden Landing, Ravenswood, and Bair Island. 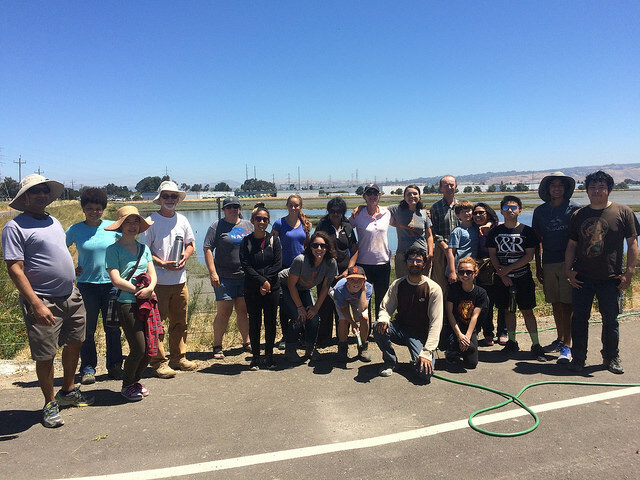 We also partner with others around the Bay such as the City of Palo Alto and the East Bay Regional Park District. 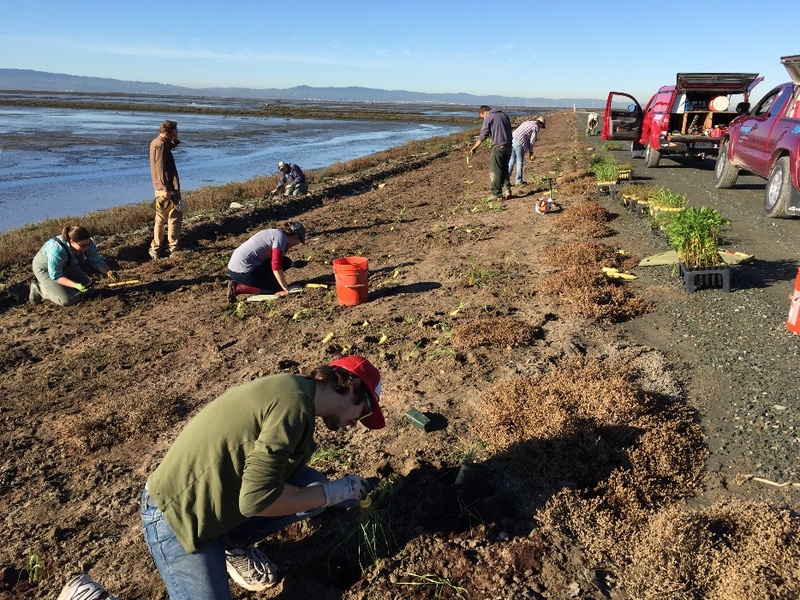 The South Bay Salt Pond Restoration Project has a lot of partners, and we feel really fortunate to be one of them, and to work on such a cool project. I am also continually grateful for the amazing collaborative scientific community in the Bay area. As a scientific community, we all have a lot of work to do to restore marshes and prepare for the climate change impacts on the horizon, and I’m optimistic that we are all up for the challenge because of our ability to work so well together. Our volunteers love our restoration staff, and I always feel lucky to get out of the office to work with them on one of our programs. And then, actually getting to bring people to the edge of the Bay who haven’t been there. It is so fun to see the new appreciation and excitement when people experience what is for them a new part of the Bay. We love that the SBSP Project has chosen us to partner with them at Eden Landing because it’s a particularly good example of a really beautiful and remote area of the Bay that we can share with the public. At Eden Landing, you feel like you are in another world. It’s particularly special if you get there at seven or eight in the morning – the colors of the marsh, the big rafts of birds flying up – it’s very cool. It’s just mudflat and marsh, and it’s really beautiful. Can you tell us about a moment you found particularly memorable? I was on one of our student education programs, and at the end, the kids were kicking rocks, turning over stones, like kids typically do at the edge of the Bay. They were from a school in Oakland. I asked them, “How does it make you feel?” One girl said, “It makes me feel peaceful.” That really touched me. We have youth – they may be struggling in school, or they are in neighborhoods that are crowded or stressful. There’s a lot of trouble in our world right now – to be able to bring people out to nature, and give them that experience is really special. How do you like to enjoy yourself on the Bay? I love to be out on a boat on the Bay in any form, and am fortunate to belong to and support a fun sailing team that benefits people recovering from their journey with cancer. I also love walking along the Richmond Shoreline and enjoying the beautiful views of San Francisco and the rich WWII history associated with that area. How did you first get interested in working along the Bay? I grew up in Seattle and I always loved being near the water. Later, I raised my family in Port Angeles, Washington, which is a small town right on the water. I took my kids to the beach and to the shore a lot – that’s how we were as a family, we liked to visit tide pools…. When I went back to school, one of my required classes was a Wetland Restoration class and our study sites were located in salt marshes. The first time I set foot into the marsh, I fell in love with it, and knew that it was where I wanted to work. I’ve lived other places, like Wyoming, and I can’t wait to get back, to get back to the shore. It’s really hard – when you’re inland, you feel sort of like a fish flapping around. The great news that the Restoration Project received $7.4 million in new funding from regional parcel tax Measure AA was widely covered, including articles by the San Francisco Chronicle and the Mercury News. The money will pay for significant pieces of our Phase 2 construction work in all three of our pond complexes. 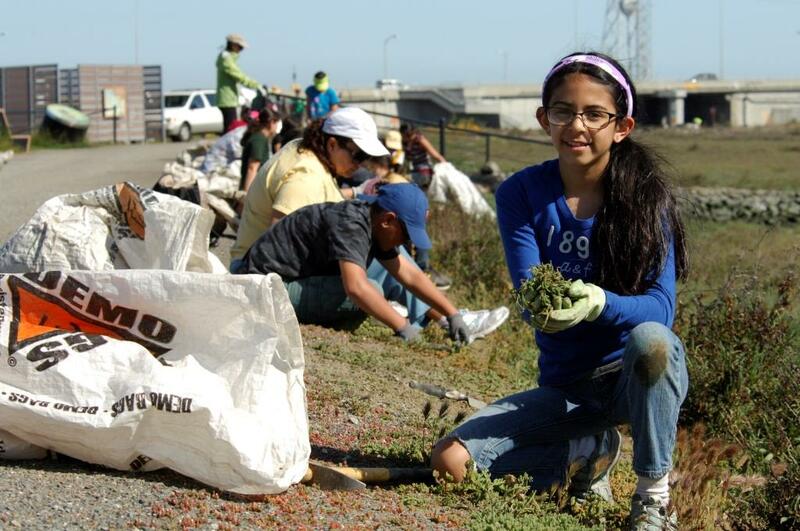 Join Save The Bay this Saturday for a day of service at Eden Landing! You will help our restoration team remove invasive plant species that can take over our wetlands and prevent the growth of native species. Protect our wetlands from invasive weeds and enjoy the beauty of nature this Saturday! To register, click here. Photo Credits: Cris Benton; Judy Irving, Pelican Media; Michael Macor, San Francisco Chronicle; Save The Bay.